Sparkly Sequin Dress . Dispatched with Royal Mail 2nd Class. BNWOT, never won't before, excellent condition. Size is Xl but would fit a 14/16/18. Has a lovely open back and flattering fit, selling as I've never worn it! Green Sequin Lace Overlay Off The Shoulder Dress Size 8. Condition is Used. Dispatched with eBay delivery – Shutl 2-3 days. Rose Gold/Bronze Sequin Dress size 12 with cut out detail. Condition is Used. Dispatched with Royal Mail 2nd Class. rose gold sequin dress Backless Size 10. Condition is Used. Dispatched with Royal Mail 1st Class. Select Silver Sequin Dress Size 12. Condition is Used. Dispatched with Royal Mail 2nd Class. Beautiful mini dress! Worn only once. From smoke and pet free home. Happy bidding! Boohoo sequin dress. Condition is New with tags. Dispatched with Royal Mail 1st Class. You can alter the length at the side so it can be a long dress or a mini. Alice And Olivia Gold Sequin Strapless Dress Size 8. Condition is Used. Dispatched with Royal Mail 2nd Class. Super sassy sequin tassle bodycon dress. Perfect for the festive period. Ladies Size 14 Quiz White/holographic Sequin Strappy Dress. Condition is Used. LOVE this cute party dress, worn once but unfortunately too big for me! A few sequins have fallen off but still in great condition to be worn again! 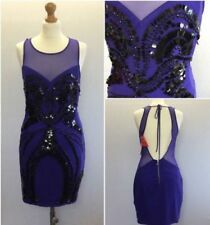 Prettylittlething Mirror Sequin Bardot Dress NEW WITH TAGS size 4. Condition is New with tags. Dispatched with Royal Mail 1st Class. Asos Sequin Skirt Sleeveless Dress Size 18. Condition is Used. Dispatched with Royal Mail 2nd Class. Sequin Embellished Dress Size 10. Never worn in perfect condition! New listingNEXT BURGUNDY COWL NECK SEQUIN DETAIL DRESS SIZE 12 BNWT RRP £22! NEXT BURGUNDY COWL NECK & SEQUIN PANEL DETAIL DRESS SIZE 12 BNWT RRP £22!. Condition is New with tags. Dispatched with Royal Mail 2nd Class. Gold Sequin Dress 10 HM h&M. Condition is Used. Dispatched with Royal Mail 2nd Class. Quiz Sequin Dress. Black & Rose Gold. “Balmain” style. Sold out at Christmas. Worn once but kept in good condition in dress bag. Size 14. Stunning black silver sequinned flapper style dress small size 18 never worn. Fringed bottom detail i would say more of a 14/16 uk size.Dispatched with Royal Mail 1st Class. V by Very Midnight Blue Long Sleeve Sequin Dress UK16. Condition is Used. Dispatched with Royal Mail 2nd Class. Quiz high neck sequin bodycon mini dress in rose gold. Worn only once. Sale due to the fact that I need to only wear everything once.! This dress is in as new condition, despite being listed as 'used'. Gorgeous Green/blue Sequin Zara Dress Size Medium - unworn. Dispatched with Royal Mail 2nd Class Absolutely stunning dress, quite short as I have a long body so have never worn only tried on, such a shame as it really is beautiful, bow/tie detail at the back!